The first Australian wines came to Sweden in the mid 80s. They were easy to like, ripe and fruity and immediately became a sales success. Compared with the graceful European wines we were used to, the Australian wines were real fruit bombs and very priceworthy. But the quality deteriorated over time, at the expense of quantity, prices increased and sales decreased. We began to get tired of these popular, one-dimensional fruit bombs and longed for something more exciting. In order to reverse the negative trend many producers in Australia, especially small growers, have now started to invest in more personalized wines in small quantities. Greater account is taken of the natural conditions of climate, soil and grapes and this means that it is not necessary to the same extent to correct in the wine cellar what the nature accomplished. We begin to see wines characterized by grape variety, origin and personality of the human handling. The three big wine states in Australia are South Australia, New South Wales and Victoria. they are all part of the larger area South Eastern Australia, where 95 % of Australia´s wineries are located. Wines from two small producers are included in this tasting, three wines from Paracombe Premium Wines which is located in Adelaide Hills in South Australia, and one wine from Quarisa Wines in New South Wales. 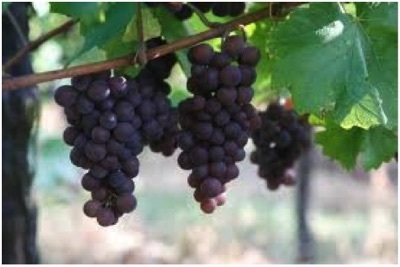 Syrah/Shiraz is grown mainly in France and Australia. Wines made of Syrah/Shiraz are intensely rich, intensely spicy and intensely fruity. Shiraz from old vines can be extremely intense. The most powerful are initially dark and dense with pronounced tannins but as they mature they get a velvety texture and sweet flavours of blackcurrant and raspberry. Australian Shiraz is rich, soft and has a certain note of leather. Paracombe Premium Wines is a small family-owned vineyard of about 20 hectares.The village Paracombe is located in Adelaide Hills, South Australia.The property is situated on a plateau 425 meters above sea level, which is ideal for wine production. The soil is lean with ironstone, buckshot gravel and quartz, an interesting remnant from an ancient riverbed.. The climate is a typical continental climate with relatively cold, rainy winters and dry, hot summers. Low yield, minimal irrigation, pruning and harvesting by hand all contribute to the excellent quality and flavour of the wines produced here. The complete production (vinification, storage and packaging) takes place on site. All the wines can be bought from Paracombe, see web site. In Sweden the wines are available on order from Systembolaget, number links to Systembolaget. Paracombe Shiraz Viognier nr 96357. Price about 20 euros. Tasting Notes: The bouquet offers dark cherry and plum aromas with hints of musk rose petal and honeysuckle. Opulent fruit flavours combine in harmony with mocha and spicy notes to add complexity and a lingering finish. This highly awarded wine has won a medal every vintage since the 2004 release. As the name indicates, this wine is made of both Syrah (= Shiraz) and Viognier. 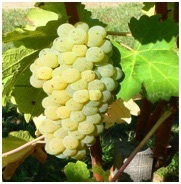 Viognier is a green grape variety and it comes originally from the Rhône Valley. The grapes give aromatic, dry, white wines with a rich bouquet of apricot and fresh spring flowers and they are so delicious that they almost feel sweet. So why is Viognier added to a red wine? The explanation is that Viognier gives a small aromatic kick to this wine even though the content is less than 10%. It is also said that the red pigments are better preserved during fermentation and that the development of the flavours is enhanced. Apart from this, it is an interesting and pleasing blend and quite fascinating how just a small amount of Viognier can influence this wine style. In Australia the addition of Viognier to Shiraz during fermentation is not uncommon, but in Europe the mix of green and blue grapes is an exceptional occurrence. It does occur however, an example is the French red wine Chateauneuf du Pape, which is produced from a blend of up to thirteen grape varieties, six of them are white. The harvest of the grapes Shiraz (97%) and Viognier (3%) is done by hand. The grapes were crushed and co-fermented slowly and cool in open vats to gain the true marriage of the varieties from the start. The "hat" of grape skins is depressed by hand in a gentle way to extract as much flavour and colour as possible. The wine is then stored for about 14 months in French oak barrels (225 liters) of which about 25% were new. Production is very limited, only 6000 bottles per harvest. This is a high-octane wine that goes well with flavourful dishes, from large dinners to pepper salami and strong cheeses. Paracombe Cabernet Sauvignon nr 70364. Price about 18 euros. Full-bodied and very fruity with medium oak character. Grape variety: Cabernet Sauvignon 100%. Alcohol content: 14.5%. Tasting Notes: Deep in colour, with rich, full fruit flavour. The bouquet has a delicious mix of aromas including ripe cherries, dark chocolate, mint, dried herbs and blackberries. Medium to full bodied flavour with lavish dark chocolate, hints of ripe grainy tannin and raspberry buried deep below. A wine offering lots of flavour with subtle oak adding another gentle dimension and superb long finish. This wine is drinking beautifully now but will reward even further still with age. Australia is, as one would expect of a country built by pioneers, a pioneer country also in terms of wine. Australia have created their own wine styles and have not tried to adapt to the classic wine styles in Europe, although the European grapes is the starting point. Cabernet Sauvignon is after Shiraz the most cultivated blue grape in Australia. Cabernet Sauvignon grapes give full-bodied red wines with pronounced tannins and a clear note of blackcurrants. Cabernet wines from the New World have more of blackcurrants flavour and are more fruity with rich, soft tannins, sometimes a hint of mint, eucalyptus or vanilla. The vines to this wine were planted in 1992. Low yield ensures good colour and intense flavour concentration. After harvesting the must is fermented in small open tanks and hand plunged. Once pressed the wine was left to mature in French oak barrels for 20 months, then bottle aged a further two years in Paracombe´s underground cellars. Full-bodied and fruity with medium oak character. Grape varieties: Merlot (48%), Cabernet Sauvignon (31%), Cabernet Franc (9%), Malbec (9%), Shiraz (3%). Alcohol content: 14.5%. Tasting Notes: This wine has an intense colour, deep ruby tones with bright edges in the glass. The bouquet provides lifted aromas of poached rhubarb and plum, together with hints of delicate oak, leather and spicy liquorice characters. The palate is generous and finely structured with rich, sweet fruit driven flavours of fresh loganberries and raspberries interspersed with savoury and spicy notes. This wine will reward with age and to be enjoyed for many years to come. This wine is made from five grape varieties, Merlot (48%), Cabernet Sauvignon (31%), Cabernet Franc (9%), Malbec (9%) and Shiraz (3%). The main grape varieties are thus the same as a Bordeaux wine but with small additiions of Malbec and Shiraz. Malbec may be found in wines from Bordeaux but is regarded as a supplement grape and is in decline. But southeast of Bordeaux, in Cahors, Malbec is included, usually to at least 70% in exciting wines. Best known is the Malbec grape because it is included in many Argentine and Chilean wines. The grapes of this wine all come from vineyards on the Paracombe plateau. The wine is a combination of the above mentioned varieties and have all Paracombe´s unique position as the common denominator. Harvesting is done by hand and fermentation takes place slowly and cool in open vats. Following harvest and fermentation, the wine was matured for 18 months in French oak barriques, of which 25% were new. Only 5000 bottles are produced. The wine has got its name from Reuben Chapman, an early Paracombe settler known for his generosity and passionate love for the area. The Reuben is a great food wine and complements many styles of food. The wine Caravan Durif comes from Riverina which is situated In the southwestern part of New South Wales. 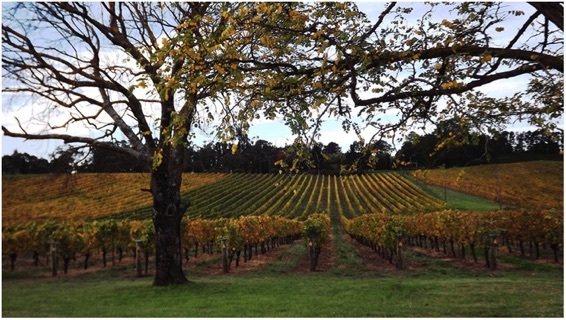 The Riverina area is New South Wales´largest wine producing region. The climate is hot and dry, i.e continental style, with very high temperatures in the summer. Irrigation is a must and early pioneers made this possible through huge canal constructions. In this climate the grape Durif thrives and produces powerful wines with excellent storage capacity. 🔺Caravan Durif nr 6573. Price about 9 euros. Link to Quarisa web site. The Caravan Durif is sold in Sweden. It is available also in Canada and in New Zealand as a Petite Sirah. An alternative wine is Storyteller Durif from Anderson Winery, Rutherglen, North East Victoria. This wine can be bought on line, see Anderson Winery. Medium to full-bodied with soft tannins and medium oak character. Fruity aroma and flavour with notes of blackcurrants, blackberries, mint, chocolate, vanilla and spicies like cloves and cinnamon. Alcohol content: 14.5%. 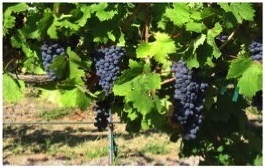 Grape variety: 100% Durif (Petite Sirah). Tasting Notes: Bouquet: Intense, youthful, fresh, ripe berry fruit flavours with some well integrated vanillian oak. Palate: Full-bodied, dense ripe berry fruit flavours balanced with vanillian oak but yet long and smooth. Australia stands out, besides adding white wine grapes to red wine, also by making wine of unknown grapes such as Durif. What is Durif and where does it come from? Durif, or as it is called in California, Petite Sirah, is an accidental cross between Syrah and Peloursin and originally comes from the south of France. Petite means small and relates to the grapes, the leaves and vines are large. The small grapes have relatively thick skins from which the wine gets a lot of tannins. What are the characteristics of a wine made of the Durif grape? The color is deep, almost opaque, the aroma is earthy, spicy and peppery and the flavour is reminiscent of ripe blueberries, blackberries and plums. The wine is often rich in tannins which enables it to be stored up to 20 years. In short, wine made of Durif is incredibly powerful and rich - a red wine with character. Compared with Shiraz the colour is darker and more purple and it feels rounder and fuller on the palate. The wine is made of 100% Durif. After the harvest in March it underwent both a malolactic fermentation* and a seven-day maceration. The wine has been stored for ten months in 300-liters new American oak barrels (25%), 50% was stored in one-year French 300-liters oak barrels and 25% in older American oak barrels. The wine can be stored for up to eight years. * Malolactic fermentation is a process in which bacteria converts malic acid to lactic acid, which makes the wine softer and rounder. Durif is excellent to meat dishes, especially grilled. The label must indicate production area, vintage and grape varieties. The simplest wines are labelled Produce of Australia. followed by South-Eastern Australia, which is a widespread expression of popular blends. 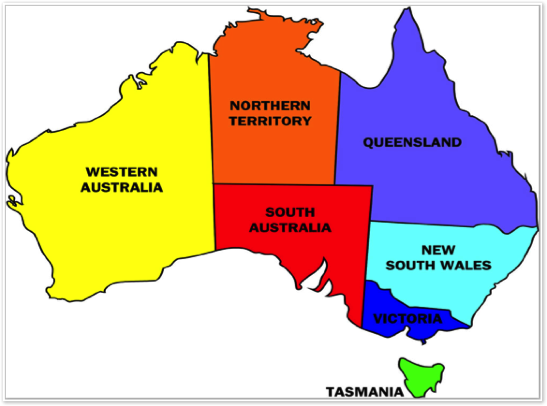 State of Origin is the next level and in every state there are a number of zones. Regions are even smaller and some are divided into sub-regions. Wines from prime vineyards can be labelled Outstanding or Superior. These flavourful wines are excellent to fried or grilled meat of beef or lamb. Here grilled black pepper glazed entrecôte is suggested with potato salad. Start with the glaze: Peel and finely chop the onion. Peel and crush the garlic cloves. Melt the sugar in a saucepan without stirring until it is light brown. Add water, stock and vinegar to it.The sugar may solidify when the liquid is poured on but it dissolves after a while. Add the onion, garlic, black pepper, apple sauce and liquid smoke. Let simmer until the glaze thickens about 20 minutes. Season with salt. Mix the corn starch in cold water and whisk into the glaze. Save half of the glaze to the serving. Season the meat with salt and pepper. Grill on indirect heat until the internal temperature is 60-65 degrees, approximately 45-60 minutes. Brush with glaze often for a richer flavour. Cut the meat into generous slices and serve with herby potato salad and lettuce. Peel the potatoes and cut into suitable pieces. Boil the potatoes but be careful not to boil too much, they should be firm. Chop the onion into small pieces. Place the potatoes in a large bowl, sprinkle over the herbs and red onion. Mix the dressing and pour over the hot potatoes. Mix all ingredients and serve hot or at room temperature. End the meal with cheese, for example Gruyère, La Tome Basque (French farm cheese) or Morbier. Full-bodied and very flavourful wines, like this wine made of Cabernet Sauvignon, are very good with fried or grilled red meat - especially lamb. Wild game, such as deer and elk, duck and goose. Cold roast beef is also suitable food. Paracombe The Reuben nr 75982. Price about 18 euros.